In the 1970s, Dr. Carl Simonton, a cancer specialist, noticed that some people who were expected to die of cancer were living well past what their cancer diagnosis indicated. If you were alive then and remember the news reports, you will also remember what a big deal it was. I do. I remember reading articles about mobilizing your killer cells (NK cells) within the body to destroy cancer cells using your mind’s ability. Using a process Dr. Simonton called “focused relaxation”, the patient was taught how to see within the body using the mind’s eye to image the body fighting off and killing the cancer. There were some remarkable successes and together with his wife Stephanie, he wrote a book about it (Getting Well Again). I was intrigued at the time and put it in my mind to read some day but never did. Then I was diagnosed with cancer and those studies came to mind. Cancer woke me up quickly – talk about focus once you get such a diagnosis. I wanted to put visualization in my tool box, but didn’t like any of the scripts I read from the many books around. Since I really didn’t want to use the imagery of bombing the cancer (see The Peaceful Way in Attitude), I tried to think of a way to do a visualization for health instead of making war on the cancer. 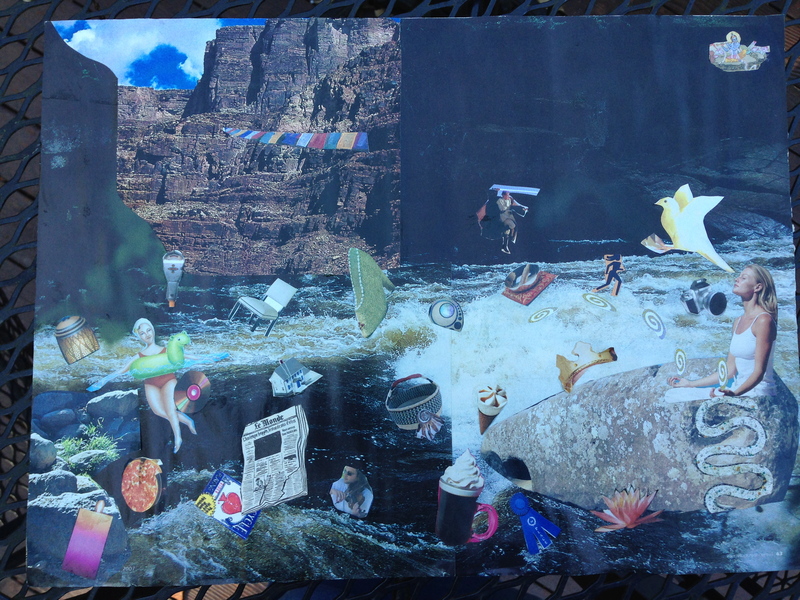 I’m so in love with doing collage that I thought, hey, make a vision board. Now a vision board is just a picture you make to inspire you, to keep you focused on what you want, to fill your mind and heart with the positive instead of the negative. I buy some foam core, cut out pictures from magazines and paste up a picture. Here’s one I made about meditation. You can tell how cluttered my mind can get. I called it Spring Cleaning. If this appeals to you (and I hope it does, as it is fun. And it’s good to have fun and forget the diagnosis for just a little while) this is how to do it. Decide what you want your future to look like, cut out pictures from magazines and paste them down on a board. Look at it every day, add to it when you find new, inspiring pictures. Take this picture to heart, let it inspire you to get to that new world, create that new world. Putting things down in concrete, visual form is a very good way for you to focus on where you want to go. I always put a candle in front of it because it makes me take a pause for the sacred, but you certainly don’t have to. You can read related posts about this in Techniques/Intention and Scripting and Attitude/Attention. I’ve carted this picture around for probably 25 years. 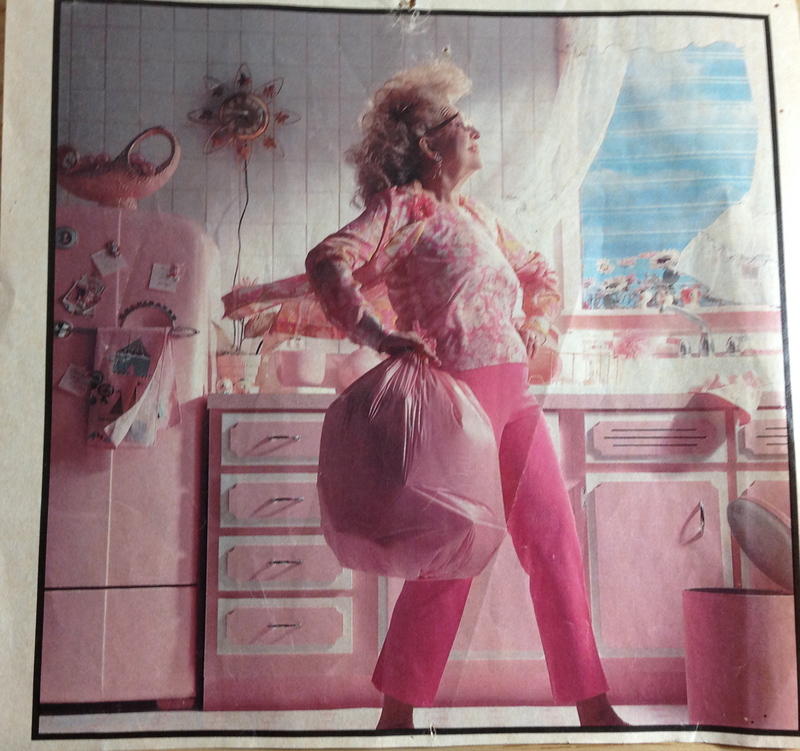 This lady’s zest for life and her complete confidence in her choices (PINK!) just inspire me. You can tell how beat up it is and how many times I’ve thumbtacked it to the cork board over my desk. All on her own, she is my little vision board; looking life straight on, walking forward into the future, strong, confindent, happy. She’s my pink guru. 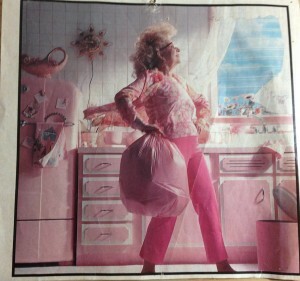 (I think it was a Glad garbage bag ad. You find treasure in the oddest places). If pasting pictures doesn’t appeal to you, try the Resources section. There are books and websites that will help you learn how to do it well. You could start with Dr. Simonton’s book but there are multitudes of others out there. It is pretty accepted now in medical circles, so you might ask you medical provider if she has anything to recommend. I have had great success using hypnotherapy to get started on the visuals. I would only recommend, if you try this, that you get referrals. Not all hypnotherapists are created equal, just like doctors, come to think of it.